Architectural coordination of enterprise transformation (ACET) integrates and aggregates local information and provides different viewpoints, such as financial, structural, or skill perspectives to the respective stakeholder groups, with the aim of creating a consensus and shared understanding of an enterprise transformation among the stakeholders. Its core purpose is to inform decision-makers with both local and enterprise-wide concerns so that the overall transformation goals can be successfully pursued, i.e. reducing inconsistencies and including local decisions in the overarching goals. This book consists of three major parts, framed by an introduction and a summary. 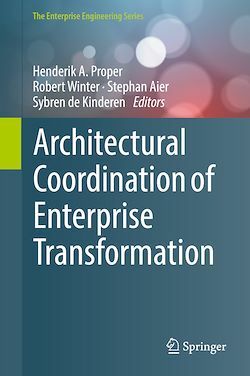 To enable readers to gain a better understanding of the issues involved in real-world enterprise transformations as well as the possible role of architectural coordination and the associated challenges, Part I provides an analysis of status quo of corporate ACET practice. Part II then continues with an exploration of the challenges facing ACET from a theoretical perspective. Based on these challenges, Part III then presents a collection of components for a possible design theory for ACET. Instead of an integrated method, this collection of components constitutes method fragments that can be arranged in different ways depending on the perspective taken, the actual enterprise architecture management approach, the enterprise transformation type and the transformation’s context.